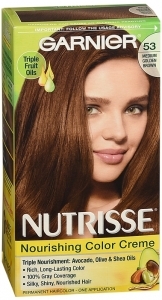 Provides a nourishing color treatment that gives you rich, healthy-looking color that really lasts. The exclusive color treatment, enriched with conditioners and fruit-oil concentrate, penetrates into the hair fibers to nourish deep down while delivering rich, long-lasting color and 100% gray coverage. HAIRCOLOR PRODUCTS CAN CAUSE AN ALLERGIC REACTION WHICH, IN CERTAIN RARE CASES, CAN BE SERIOUS. THEREFORE, BEFORE YOU USE THIS PRODUCT IT IS NECESSARY TO FOLLOW THESE PRECAUTIONS: DO NOT USE: if you have already had a reaction to a haircolor product; if you have a sensitive, itchy or damaged scalp. PERFORM AN ALLERGY TEST WITH A PORTION OF THIS PRODUCT 48 HOURS BEFORE FULL APPLICATION (SEE THE INSTRUCTION SHEET). Avoid contact with eyes and skin (other than areas of application). If product gets into eyes, rinse with lukewarm water immediately. Wear gloves provided in kit. Thoroughly rinse hair after application. Do not use for anything other than coloring your hair. Do not use over compound henna or progressive color. Do not inhale or ingest. Keep product out of the reach of children. THIS PRODUCT CONTAINS INGREDIENTS WHICH MAY CAUSE SKIN IRRITATION ON CERTAIN INDIVIDUALS AND A PRELIMINARY PATCH TEST ACCORDING TO THE ACCOMPANYING DIRECTIONS SHOULD FIRST BE MADE. THIS PRODUCT MUST NOT BE USED FOR DYEING EYELASHES OR EYEBROWS. TO DO SO MAY CAUSE BLINDNESS. FOLLOW THE INSTRUCTIONS.